At Infinity Farm we specialize in horse care the way nature intended. 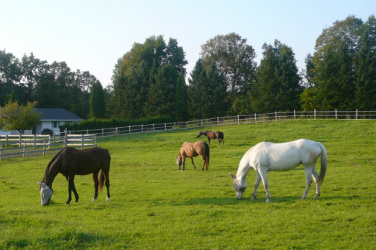 Our full-care facility is located on 39 acres of pasture and established trails. The large 10-stall barn boasts a heated tack room and plenty of space for both horse and owner. Your horse will love it here! He/she will enjoy an environment where turnout is valued and optimized, important for the physical and mental well-being of the horse. While out, your horse will enjoy quality hay and/or pasture and free-choice salt/minerals. Water is heated outside during the winter months. We don't feed low-quality round bales, instead offering first and second cutting hay up to five times daily (this includes a midnight feeding). Our roomy box stalls are cleaned and bedded daily with fresh pine shavings. Natural insect control is utilized in the form of fly predators and guinea fowl (proven effective against ticks). Our philosophy of equine management is horse-centered, ensuring that your horse will live as naturally as possible in a safe, clean and comfortable environment. In addition to regular veterinary and farrier care, boarders may also elect to use complementary therapies (equine massage, acupuncture, and/or chiropractic). We truly take a holistic approach to horse care. Owner managed/operated for consistent feeding and the best of care for your equine friend. You will love it here! You will find a relaxed, friendly atmosphere offering use of the full-size, fully-lit indoor riding ring (dust-controlled footing) with jumps and cavaletti available, groomed sand outdoor riding ring, round pen, and 25+ acres of trails. Access to an additional 100+ acres of trails as well. No commercial lesson program/summer camp to compete with for use of the facilities. Riders of all disciplines are welcome.